Travel Trends, October 1, 2009: Five years after first examining family hotels and family resorts, FTFc discovers even more investment in themed hotel rooms and children's programs around the world.Travel Trends, October 1, 2009: Five years after first examining family hotels and family resorts, FTFc discovers even more investment in themed hotel rooms and children's programs around the world. In 2005 Family Travel Forum’s FTFc consulting division reported on the trend of forward-thinking hotels catering to the needs of tiny travelers. Nearly five years later — after tsunamis, hurricanes, H1N1 and the Great Recession — the staff at FTFc decided to revisit the topic. We discovered that kid-friendly amenities are more popular than ever with family vacationers and, despite a dismal economy, continue to expand in variety and scope. According to a 2009 YPartnership report, 43% of U.S. adult travelers took one or more trips with kids in 2009, up from just 26% in 2000. That sea change in leisure travel demographics has led marketers to reach beyond parents to target their young audience directly, in recognition of the universal truth: If the kids aren’t happy, no one’s happy. According to the U.S. Travel Association, in 2009 leisure travel has declined just 2.2% despite a much larger loss in the average family's savings. That’s good news for family hotels and family resorts throughout the U.S., Canada, and around the world who have invested in increased family facilities such as children’s programs, welcome gifts and themed family suites. The trend is even more apparent at upscale and luxury hotels. And unlike WiFi at mid-priced hotels, or widescreen TVs and in-room coffeemakers at upscale brands (expenses which hotels have had to absorb as clients become more demanding), kid-pleasing amenities are something many hoteliers have figured out how to charge for. A positive sign for these and other hotels like them is that nearly 60% of family travelers take advantage of the children’s services offered (USTA), with kids meals or menus and hotel discounts being the most utilized. In this difficult economy, hotels and airlines are marketing a variety of child-appealing perks directly to family travelers because they know they will get a response. Since FTFc's 2005 report, most of the family hotels and family resorts with expensive kid-friendly themed rooms have flourished, and several have incorporated new organized activities and family-together programs into their roster. Others, like Howard Johnson's who had partnered with the Crayola art supplies brand, have remodeled their Crayola Kids Rooms. According to a spokesperson from Wyndham Worldwide, owner of HoJo, since the hotel chain caters to a variety of travelers ranging from business and seniors to families, kid-themed rooms were not always appropriate, so they were removed from all locations. However, each individual property can choose to reinstate the Crayola rooms, says Wyndham, if owners feel their location has an active demand for them. In summary, because the trend of reaching out to a younger audience has proven a success, hoteliers are becoming more sophisticated in their family and kids' offerings, and in their ability to charge for them. Between June and September 2009, FTFc interviewed all the properties noted in the original report, "Kids Dig Hotels Designed With Their Needs In Mind," to learn what had changed in their approach to guests on family vacations. Most of the sales and marketing managers reported an increase in children's amenities and family vacation packages. The trend extends beyond theme park destinations to centers of enterprise. The Swissotel Chicago is another hotel which met with success by offering kids suites and a "Very Important Kids" program. Families are among the largest percentage of their customer base, so adding kid-friendly programs was a given, at a certain price point. Swissotel has managed costs (and their commitment of resources) with convertible kids suites. Their elegant two-bedroom suites house business travelers as needed; when families book one, the master king bedroom remains tastefully beige while a connecting double double-bedded guestroom is outfitted with fun-themed softgoods to delight children. A representative for Swissotel Chicago reports that families love to take advantage of the VIK program that caters to kids, singling them out as special travelers with welcome gifts and a dedicated check-in. Swissotel Chicago is considering adding more kids programs and family packages in the future, perhaps with a cultural partner, to expand their reach both within the community and to different age groups. At Hotel Metropolis in San Francisco, the management has redone the kid-themed rooms based on personal experiences traveling with their own children. They have established an atmosphere that welcomes children into the hotel, providing them with their own room and special amenities, thus creating a home-away-from-home for kids. 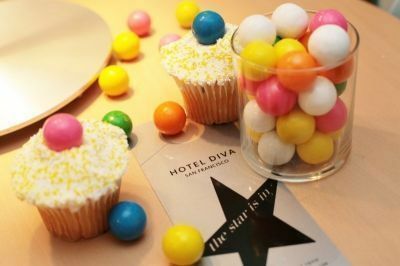 Since then, this outpost of the Personality Hotels group has incorporated themed guestrooms into two sister properties, Hotel Diva and Hotel Union Square, both in San Francisco as well. Since FTFc's 2005 report, the Ritz-Carlton Cancun had to be fully renovated after extensive damage from Hurricane Wilma. The "new" luxury resort has added several kids’ suites and special baby-only rooms to accompany the always-popular "Ritz Kids" program, as a direct result of an increase in multi-generational travel. To counter the recent economic downturn for its most prized guests, the Ritz-Carlton is giving traveling families more for their money, increasing the value of their services with a special Our Love & Family package. They plan to continue expanding their programs and organized activities to appeal to all ages. Other hotels, such as the historic Wort Hotel in Jackson Hole, Wyoming, joined the movement when restoring the property. "We felt we had a unique opportunity to celebrate our western heritage by designing suites around key cultural and geographic elements of the region," notes general manager Jim Waldrop of their rustic-luxe themed suites. The cowboy, cowgirl and Native American theming has had strong support from Adventures By Disney, the family-oriented tour operator which books rooms for participants on its national parks tours. Largely families, these 'group' guests appreciate the hotel's unique place in the region and, as doting parents, have enhanced the hotel's bottom line by bringing kids to the famous Silver Dollar Bar for a look and a snack. Waldrop and his staff are delighted to have more engaged guests, adding "The project has been so remarkably well received." Once thought frivolous luxuries, kids themed suites have been largely spared from the hospitality industry's wholesale cost-cutting of the past year. "Any time you add original artwork, sculpture, hand carved doors and other interesting and intricate items to the maintenance and upkeep of a hotel, it does add expense but the overwhelming response from our guests and visitors is well worth it," says Waldrop about the Wort Hotel restoration. Many hotels are even adding family services and amenities, further enticing families to stay at their property and take advantage of the special rooms and kid-friendly perks they provide. Special rooms, kid-friendly perks, and innovative family services can be leading revenue-generators for these properties, and have grown with the trend for hotels to disaggregate fees in order to enhance the bottom line. Here are the key findings for 2009 in comparison with FTFc's report from 2005. Hotels are now designing "suites" for families, as opposed to just decorating a standard double hotel room. This enhances the rack rate as well as the special services that can be offered. For example, many hotels equip the kids' side of the suite with its own pay-TV entertainment center, making kids feel like their needs are being taken care of. 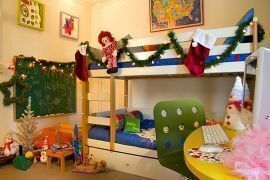 Kids suites have also grown to include an adjoining room (which can be themed on demand), giving parents and children separate spaces and more privacy. Special room service deals and bedtime treats, youth spa treatments, and other kid-friendly activities (daycamps, hair braiding, kids-only tours, junior cooking classes, video arcades) have been added to guest offerings, thus increasing both revenue and overall guest experience. Hotels are also offering perks such as "kids eat free" offers or in-house Mom's Night Out supervised events, both of which encourage parents to take advantage of the dining options offered on-site rather than go to a nearby restaurant. Many hotels now provide families with a complimentary guide to kid-centered activities in the area. Unlike Four Seasons' imaginative (and costly) KidsConcierge program, these are usually cheap PDF brochures. Some hotels, such as the Swissotel Chicago, even break the lists down into boy and girl activities, featuring hot spots that cater to specific interests. Many hotels garner commissions from local tour operators and shops when families participate, as well as benefit from collateral advertising. Some hotels are moving away from branded character themes to no-cost themes such as animals or the environment at the destination. Similarly, the local attractions that bring people to their hotels in the first place have become the focus of family-themed rooms. Partnering with a local non-profit or cultural institution provides hotels with collateral marketing opportunities, and guests with a more complete experience of their desired destination, inviting kids esepcially to learn about their surroundings. Has the effort and expense involved been worthwhile for these hotels? When we asked Jim Waldrop at the Wort Hotel if he hoped to add more themed guest suites in the future, he promptly replied, "If the right time and appropriate theme presents itself, absolutely." Read more about: How American hotels and resorts are catering to families and growing their business. Read more about: What family-friendly resorts around the world are doing to profit from the family market. It is a very interesting article. I'm very glad I've found it. Before reading it I've known very little about market. Quite a useful article for a naive..
Vacationing has become so much a part of a familyâ€™s life that we see many hotels are doing fantastic business to cater to the children in the families â€“ they have realized that the kids are their most important â€œclientsâ€ and come u with attractive packages for the family! Parents have realized that giving their children experiences outside their usual world and exposing them to different cultures will truly help them to develop their inner talent!! Thanks for sharing the article. I travel alot, and when I stay at hotels, I am seeing many more activities for kids, families, and themes for kids. I know my family always looks for hotels that cater to us and can provide us with a good experience that our kids will enjoy and remember. looks for hotels that cater to us and can provide us with a good experience that our kids will enjoy and remember. This is a great blog posting and very helpful. I really appreciate the research you put into this blog. I liked the whole post and bookmarked the blog. Hopefully, I will get more helpful information from this blog. Thanks. I have been deeply admired by your blog and its posts. I am really glad to read it and being able to share my thoughts on it. I want to use this opportunity to say that I really love this blog. It is an amazing resource of information for my working. Thank you so much. the family market is indeed very important and very lucrative. Focosing on the Family market is what Wal-Mart made big.